What is Temporomandibular Joint Disorder or TMJD? Think You May Have TMJD? The temporomandibular joint, otherwise known as the TMJ or jaw, is the joint that is responsible for eating, chewing, and general movement of the mouth. It attaches the lower jaw to the skull. You can feel your jaw joints move by placing your finger just in front of your ear and opening and closing your mouth. 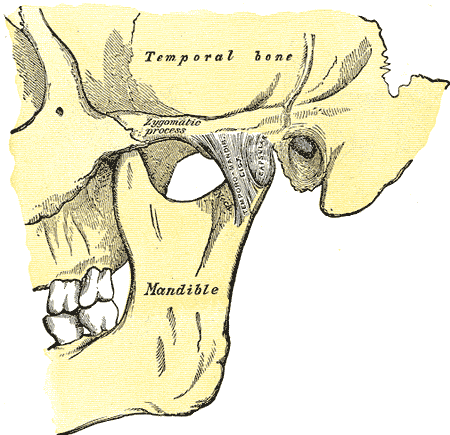 The picture above illustrates the TMJ. The jaw joint is one of the most frequently used joints in the body. It has been said that when you swallow, you are putting 25 pounds of pressure on your jaw joints! What is Temporomandibular Joint Disorder/ TMJD? Temporomandibular Joint Disorder causes pain in the jaw and surrounding muscles along with difficulty in opening the mouth. It can be confused with many other health problems like ear infections and migraines. It is estimated that TMJ disorder affects about 35 million Americans, mostly women. What Causes Temporomandibular Joint Disorder/ TMJ? The temporomandibular joint is a complex web of bone muscle and tendons, so many things can cause the jaw to not operate smoothly and cause jaw pain. Symptoms of TMJ disorder can stand alone, or be the result of another condition altogether. There are many different ways dentists and/or doctors treat TMJ disorder. However, it is important to understand that none of these treatments have been extensively researched or proven to work. With this in mind, the National Insitutes of Health (NIH) recommends that patients stick with conservative, non-invasive therapies and self-care techniques and lifestyle changes. Who Treats Temporomandibular Joint Disorder/ TMJ? Unfortunately, there is no board certified specialty for treating TMJ disorder. As a result, many specialties treat it, each with their own ideas. For example, an orthodontist may suggest braces, a dentist will lean towards splint therapy, and an oral surgeon would be more likely to suggest surgery. If you are confused about where to start, your general practitioner could lead you in the right direction. As with any treatment, it is always good to get a second opinion before you begin. More information on how to find a TMJ dentist or doctor.. Think you may have TMJ Disorder? The majority of people diagnosed with temporomandibular joint disorder get better with little or no intervention. As a general rule of thumb, the National Institutes of Health (NIH) suggests choosing conservative, non-surgical therapies along with simple home care and lifestyle changes to help relieve your jaw pain. Have questions or want to talk with other TMJ patients? Join our TMJ support community, or find us on Twitter and Facebook.